For the past month I’ve been using a Cintiq 13HD 13.3" Interactive Pen Display. Previously I had been using the Wacom Intuos 4, and I was a Intuos 3 user before that. Like many, I was excited about the idea of having a display built into the tablet because I thought it would be great for editing images. It seemed like a brilliant idea, so I was excited when my review unit arrived. During my testing I tried it both with a MacBook Pro (pre-ThunderBolt) and my Windows 7 based Alienware Aurora systems. I started off by doing a calibration as the default picture quality on the display was terrible. Overall I found the setup and ease of use on the Mac to be very good. Things just worked for the most part, but on Windows the drivers didn’t seem to be very good. Despite downloading the latest driver off the web, my Drobo Pro connected via iSCSI stopped working when I installed the tablet driver. Over a month later I haven’t been able to figure out what it did, so I’ve had to resort to using my Drobo in the very slow USB mode. I eventually got it working on my PC, but it certainly was less stable than my Intuos 4 (in USB mode). It’s times like this that I’m glad that I can review products because this is one that I found to be very disappointing. Perhaps it is because I use a Asus Zenbook with a touch screen as my daily work laptop, but I found the display both lacking in color depth and the touch performance to be mediocre. The pictures always show vivid images, but the viewing angle of this device isn’t very good so you have to be looking at it fairly head on to get the best picture quality. Another practical oddity that you never think about until you own one these is that you can’t just drag your pen to objects on your other displays. You must first tap a display toggle button, otherwise your pen is locked to the Cintiq or your other displays. While this logically makes sense, in practice I found it hard to get used to. Ironically I found that I didn’t really like running Photoshop on the Cintq because on the Mac the toolbar would default to the non Citique display so I kept having to toggle back and forth between displays to use the menu. While I could move the Mac’s menu to the Cintiq, that isn’t where I wanted it for all of my other apps. Windows applications are self contained so they worked much better with the Cintq, but the tiny display was too small to host all of Photoshop. As a result, I found myself leaving the main app on one display and dragging just the window to the Cintq. This lead me with the Mac problem where I had to toggle to switch my cursor back and forth between the Citniq and my other displays. This was too cumbersome and annoying. Perhaps the most shocking discovery was that for precise photo editing, the small display was challenging to use and my hands kept getting in the way. Sure, I could do nice demos of how things work but in practice I hated editing photos directly on the Citniq display. This lead me to use the Cintiq as a regular tablet, rather than something I can edit with. 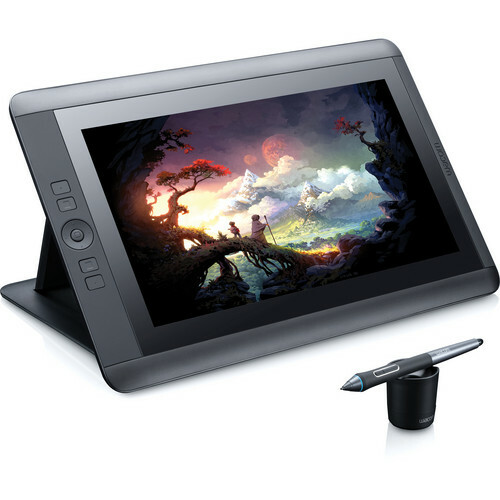 Due to the previously obscene prices of the Cintiq’s, I never bothered to buy one and I couldn’t get one to review. After being used to Retina iPad’s, iPhone’s, and Windows 8 touch devices my bar about what I expect from a color display and touch screen is high. The Cintiq display failed to meet those expectations. It felt a bit like an outdated display with only pen technology to control it when my fingers were expecting to be able to do both touch and pen (like a Samsung Note or Windows Surface Pro). I’m sure there will be fan boys who scream bloody murder at my review, and there’s probably sketch artist who will appreciate the Cintiq’s more than me. However, I ended up either not using it, or using it only as a tablet during a portion of my review period. My advice is to save your money and get a Wacom Intuos 5. You’ll get pen performance that is roughly the same as the Cintiq, but you’ll have money to buy a good display like the NEC PA Series. This is basically what I’m doing now, but I anxiously await the near future when all my displays have capacitive touch support so the Cintiq won’t make any sense. Even today, a device like the Lenovo ThinkPad Helix gives you a touch display that is better than a Cintiq with a tablet & laptop included for only a few hundred dollars more. Click here to order the Cintiq 13HD 13.3" Interactive Pen Display at B&H web site, or go for the Wacom Intuos 5 instead. I was provided with a loaner tablet which I returned after publishing this article. the 13hd is the budget cintiq, for those of us who want a cintiq but cant manage to throw $2500 at wacom but even then, the price difference between a well calibrated display and its non calibrated counterpart is ~$200, any artist should be perfectly capable of calibrating their own display, as you should have a quality monitor as a reference point, if you dont have a quality reference point and dont know how to calibrate, you probably dont need a color accurate monitor, it shouldnt matter to you, and you probably shouldnt be buying this anyways. its lower than i'd like, but 700:1 isnt bad. as far as im aware you can set (At least in windows) the tablet to cover all monitors, though this is a completely pointless feature on a touch screen for obvious reason, whenever i use my tablet with my 2 monitors, i use my mouse to control things, and the pen to draw, do you adjust your canvas in real life with your paint brush? i think not, this is a silly thing to complain about. especially since its unavoidable. ??? previously? so your telling me slapping a screen $200 on a $300 intuos is worth $1000, and then adding android functionality is worth $1500? and how many windows slate pc's with pressure sensitive pens cost $2500, wacom makes great stuff, but that doesnt mean its worth it. note to you: stop holding expectations of products, do research into them and find out what it is rather than dreaming about the perfect product, if you dont have any attachments to what you want out of something, your less likely to be disappointed, and as a reviewer its easier to be objective and see how even if its not for you, how it could be for someone else, or who its targeted for. reviews need to be objective, they arent for you, they're for us, and your not us, we wont necessarily share your opinion, state facts, not opinions, we need to make those ourselves, since were the ones buying the product. I'm not sure what to say because it seems at times you are agreeing with me and at others you are mad at me for not saying this is a great product. Personally, I've found that using the Intuos Pro meets my needs as a photographers when paired with a proper display like a NEC PA Series display. If you feel this product meets your needs, then go for it. My blog is about me sharing my personal opinion of what I think about a product, and I stick by my comments featured in this article.